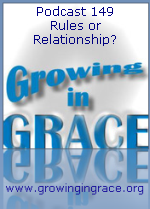 Growing in Grace Podcast: Podcast from the Past: Rules or Relationship? Podcast from the Past: Rules or Relationship? Mike and Joel are taking a break from creating a fresh podcast this Christmas week, but why not take a trip to the past with us! We're going back a few years to Podcast #149, entitled "Rules or Relationship?" This podcast originally aired on July 27, 2008. We hope you all have had a wonderful Christmas, and we're looking forward to more grace talk in 2016! We'll be back next week, taking a look at the inheritance we have in Christ.